"ACM@UCO celebrates 10 years with year-long Metro Music Series." The Academy of Contemporary Music at the University of Central Oklahoma (ACM@UCO) prepares students for careers in the music industry through a focused curriculum and real-world networking opportunities. Students can earn an Associate's degree or minor in our three core music areas. Students have the opportunity to continue their education at the University of Central Oklahoma with a bachelor's degree. Learn about how the music industry works and build the necessary skills needed to navigate it in this entrepreneurial program. Learn musicianship skills, theoretical concepts, and stylistic methods that embody current professional performance standards. Learn all aspects of the music production process through hands-on experience in the academy’s state-of-the-art recording studios. 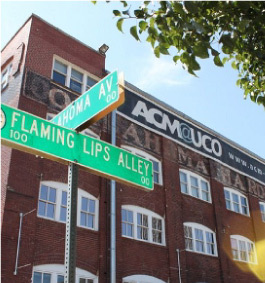 The Academy of Contemporary Music at the University of Central Oklahoma is located in downtown Oklahoma City in the heart of the thriving entertainment district known as Bricktown. The city includes dozens of dining options and numerous sports and entertainment attractions including the Chickasaw Bricktown Ballpark, NBA team Oklahoma City Thunder housed in the Chesapeake Energy Arena, multiple performance venues and nightlife. The unique tri-program curriculum of ACM@UCO is designed to grow the music industry in the Oklahoma City metro while providing a real-world education to students. We have scholarships available for those who qualify! We'd love to show you what we have to offer.